Kelsea Ballerini attended the 61st Annual Grammy Awards at the Staples Center in Los Angeles wearing Jenny Packham Fall 2017 RTW Dress (Not available online), The Abstraxt Ring ($9,250.00), The Tetra Claw ($3,250.00), The Ziggy ($3,975.00), Static 1mm Line Band ($3,750.00), Static 2mm Line Band ($4,875.00), The Mini Queen ($975.00) and The Wrap Claw ($6,325.00) all by Eva Fehren, and Jimmy Choo Misty Sandals ($850.00). Lucy Hale attended the amfAR Gala at Cipriani Wall Street wearing Jenny Packham Embroidered Tulle and Satin Gown ($4,450.00), an Antique Edwardian Spinel and Diamond Ring ($3,850.00) and Tyler Ellis Lee Pouchet ($1,500.00). 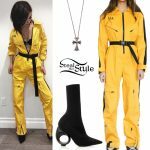 Selena Gomez posted a picture on her instagram stories wearing a Jenny Packham Fall 2016 Dress (Not available online), the Alyx Eclipse Chain Handle Bag ($268.00), Effy Jewelry White Diamond Dangling Earrings (Not available online), Established Bauble Ring with Diamonds ($23,000.00) and Sergio Rossi Bon Ton Sandals (Sold Out). You can find similar sandals for less at OverStock ($44.95). Ellie Goulding attended the 19th Annual amfAR New York Gala at Cipriani Wall Street wearing a Jenny Packham Spring 2016 Dress (Not available online), Winston Cluster Diamond Drop Earrings, Winston Cluster Diamond Bracelet and a Traffic Large Diamond Ring all by Harry Winston (Not available online), and Casadei Leather Cage Sandals ($920.00). You can find similar sandals for less at Nordstrom ($95.90). Emma Roberts arrived at the 2015 Emmy Awards tonight wearing a customized Jenny Packham Fall 2015 Dress (Not available online), a Lee Savage Stack Clutch ($888.00), a Diamond Box Chain Necklace. Tobey Diamond Stud Earrings, a Toby Diamond Bracelet and White Diamond Stackable Rings all by Martin Katz, with Giuseppe Zanotti Sandals. Get the look for less with a Missguided Slinky Plunge Sleeveless Maxi Dress ($30.00) with a BCBGMAXAZRIA Flourish Stone Waist Belt ($38.00), Ross Simons Halo Stud Earrings ($50.00) and a Lulu’s Cute Gold Clutch ($39.00). 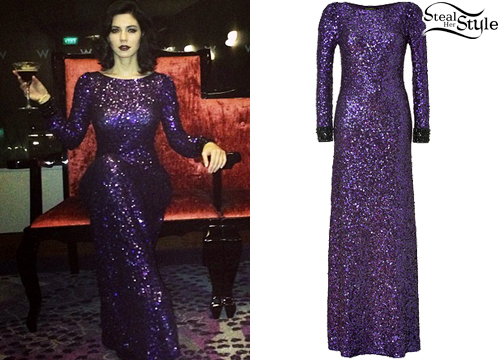 Marina Diamandis posted a picture wearing a Jenny Packham Sparkling Violet All-Over Sequin Dress ($1.709). You can find a similar dress for $160 at River Island.